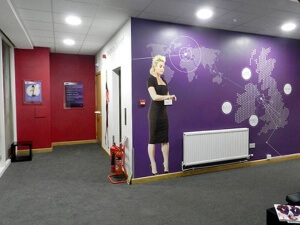 As a new flagship location for the business, we were asked to carry out a full branding exercise for the premises – including reception areas, corridors, training rooms and the warehouse itself. This type of branding throughout a company’s premises is an excellent way to fully exploit the corporate identity, which goes far beyond a logo, website and brochure. The personality and ethos of a brand should be portrayed as soon as a visitor walks into reception, and our aim was to ensure an instant impact at this point. With customers keen to see the new facilities as soon as possible, and SEKO excited to show them off, we were asked to complete the work in just 10 days. No mean feat, given that production alone on graphics of this size normally takes two weeks, never mind design and approvals. The brief was to create a flexible solution that would both be practical and visually arresting across numerous different locations within the facility. Practicality needed to be considered, to ensure the new graphics would not disrupt the working environment – while visual impact was vital due to the sheer scale of warehouse, to prevent the new signage from getting ‘lost in the distance’. Our aim was to design elements that clearly portrayed SEKO’s values, whilst also informing visitors about their vast global scope and unique industry standing. After a detailed tour of the premises, we recommended a vertical design solution for the warehouse, with branded banners running top to bottom of the high-standing racking system, some 11 metres drop! A bold and impactful visual concept was created, with a set of colour coordinated banners featuring the company’s core values. 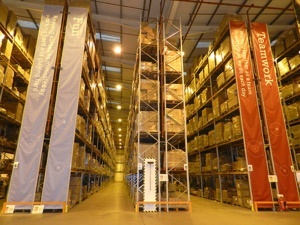 These were then installed throughout the space – not only on the shelving units, but also with smaller double sided flag banners being positioned above the main walkway, hanging from the central columns of the warehouse. 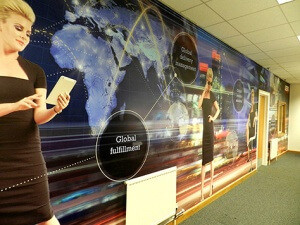 For the office space, we created an eye catching visual ‘journey’ which would take visitors through from reception, via corridors, to meeting rooms – transforming the walls into promotional and educational tools for SEKO. 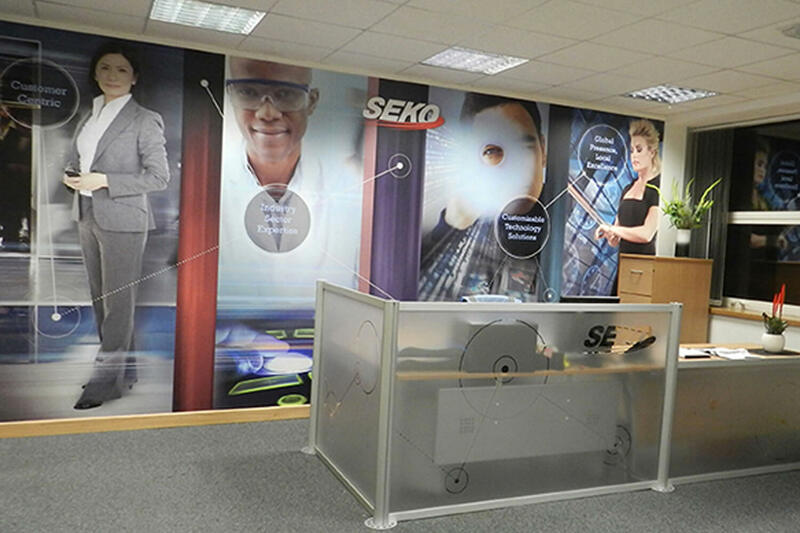 A mix of graphic panels and complete wall coverings outlined the company’s key values and global locations, as well as demonstrating the wide range of blue chip clients that SEKO works for. Each of the graphics we designed had a purpose, playing a strategic role in the visual journey which subsequently ensured that all visitors would be presented with valuable and engaging information – communicated clearly and effectively during their time with SEKO. The project was of course completed within the required 10 days, in line with SEKO’s stringent time restrictions. 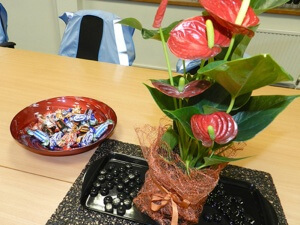 And with our usual level of obsessional detail, just hours before the first key client meeting we not only provided sweets for the attendees in matching red and black dishes, we even made sure that the plants were colour coordinated as well! Since completion, SEKO has already shown several of its high-end fashion clients around the facility, all of whom have been impressed with the professionalism of the branding – leaving with an even better understanding of what makes SEKO so unique in its field. We are now moving onto phase two of this exercise, where we will be designing a new software solutions environment, and fully branding SEKO’s training rooms. The Milton Keynes site is now being used across the business as an exemplar location – showcasing the highest branding standards, for other countries to follow. We are currently developing these designs so they can be used across each of SEKO’s other key global sites – starting with SEKO’s HQ in Chicago and working with overseas suppliers. We will then subsequently provide a toolkit of graphics, which will enable local teams around the world to easily brand their premises to the same high standard. If you need help with a paintbrush or looking for interior design inspiration, make sure you contact the Shine team by emailing april@shinecreative.co.uk or by calling us on 01252 843200.